BACKGROUND: Enhanced surgical recovery protocols are designed to reduce hospital length of stay and health care costs. OBJECTIVE: This study aims to systematically review and summarize evidence from randomized and controlled clinical trials comparing enhanced recovery protocols versus usual care in adults undergoing elective colorectal surgery with emphasis on recent trials, protocol components, and subgroups for surgical approach and colorectal condition. DATA SOURCES: MEDLINE from 2011 to July 2017; reference lists of existing systematic reviews and included studies were reviewed to identify all eligible trials published before 2011. STUDY SELECTION: English language trials comparing a protocol of preadmission, preoperative, intraoperative, and postoperative components with usual care in adults undergoing elective colorectal surgery were selected. INTERVENTION: The enhanced recovery protocol for colorectal surgery was investigated. MAIN OUTCOME MEASURES: Length of stay, perioperative morbidity, mortality, readmission within 30 days, and surgical site infection were the primary outcomes measured. RESULTS: Twenty-five trials of open or laparoscopic surgery for cancer or noncancer conditions were included. Enhanced recovery protocols consisted of 4 to 18 components. Few studies fully described the various components. Length of stay (mean reduction, 2.6 days; 95% CI, –3.2 to –2.0) and risk of overall perioperative morbidity (risk ratio, 0.66; 95% CI, 0.54–0.80) were lower in enhanced recovery protocol groups than in usual care groups (moderate-quality evidence). All-cause mortality (rare), readmissions, and surgical site infection rates were similar between protocol groups (low-quality evidence). In predefined subgroup analyses, findings did not vary by surgical approach (open vs laparoscopic) or colorectal condition. LIMITATIONS: Protocols varied across studies and little information was provided regarding compliance with, or implementation of, specific protocol components. 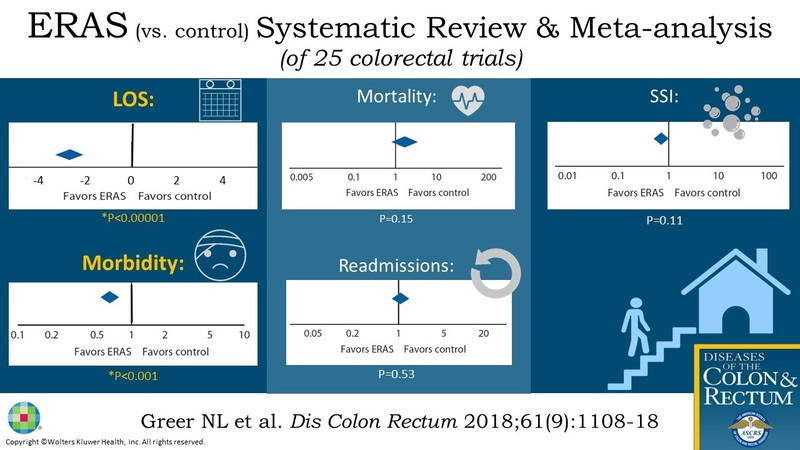 CONCLUSIONS: Enhanced recovery protocols for adults undergoing colorectal surgery improve patient outcomes with no increase in adverse events. Evidence was insufficient regarding which components, or component combinations, are key to improving patient outcomes. PROSPERO registration number: CRD42017067991. Earn Continuing Education (CME) credit online at cme.lww.com. Funding/Support: The US Department of Veterans Affairs, Veterans Health Administration, Office of Research and Development, Quality Enhancement Research Initiative provided support for the VA Evidence-based Synthesis Program Center located in Minneapolis, MN. The contents do not represent the views of the US Department of Veterans Affairs or the US Government. Diseases of the Colon & Rectum61(9):1108-1118, September 2018. Articles in PubMed by Nancy L. Greer, Ph.D. Articles in Google Scholar by Nancy L. Greer, Ph.D.
Other articles in this journal by Nancy L. Greer, Ph.D.